This software offers a solution to users who want to create a list of the folders on a computer. The user can choose to list folders in a specified folder, a specific drive or on all drives on the system. There are options to display the resulting list as a tree or to show the folders as a full path. Results can be saved as a text file, excel file or be copied to the clipboard for pasting. 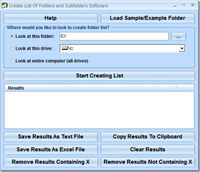 Create List Of Folders and Subfolders Software is an utility that works under windows xp, windows vista, . It supports both 32-bit & 64-bit windows editions, therefore it could run faster on 64-bit computers. Estimated download time for Create List Of Folders and Subfolders Software on a common adsl connection is less than a minute. Version 7.0 was released three thousand seven hundred fifty one days ago by Sobolsoft. Click the green download button to download it now.